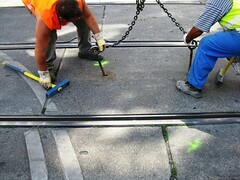 Placing tram track in the street is a key part of the tram track rehabilitation project. 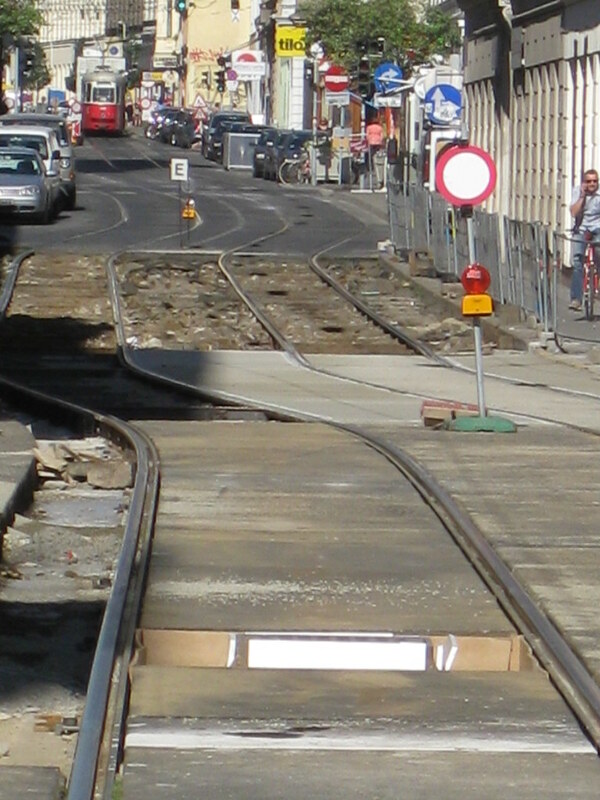 The track must be placed at the right elevation and then the track support structure and street are built around it. 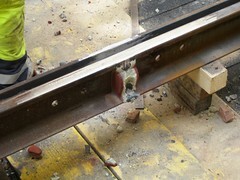 The track needs to be level and the joints need to be welded to provide a comfortable ride. 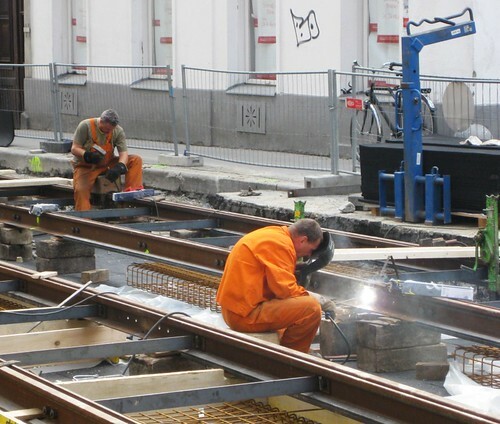 If the track is not exactly right it will cause maintenance problems for the tram wheels and the rails for the next 25-years! 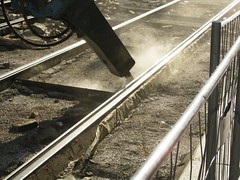 Here are photos of the track placement process. 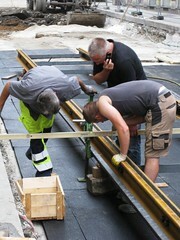 Here the construction crew is ready to start placing the track. 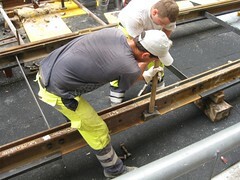 On this section they placed pre-fabricated sections of track. 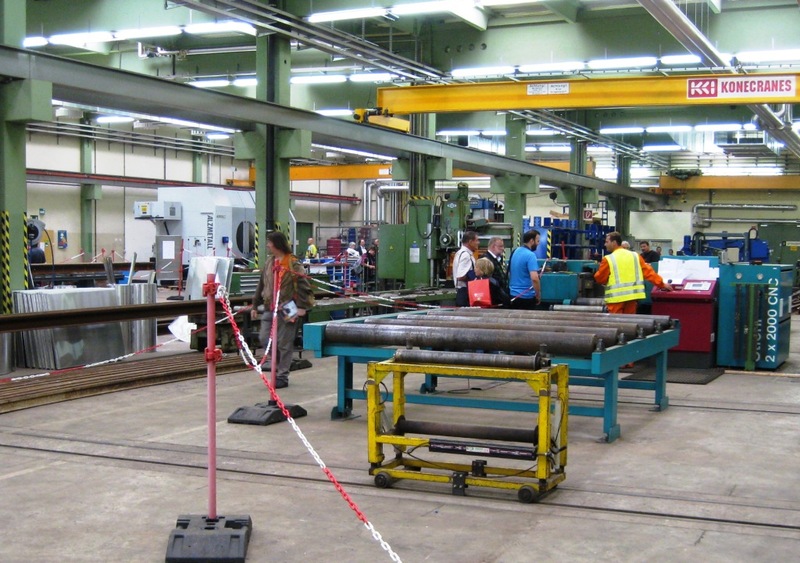 You can see one of the pre-fabricated sections in the background by the crane. 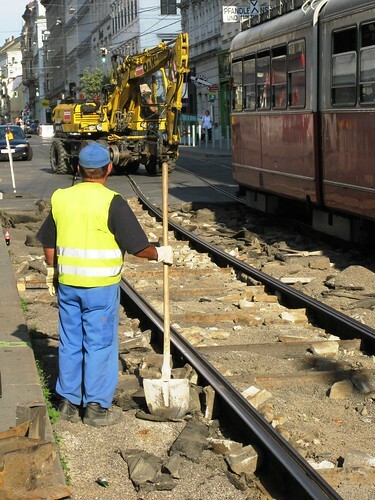 Making sure that the track is at the right elevation. 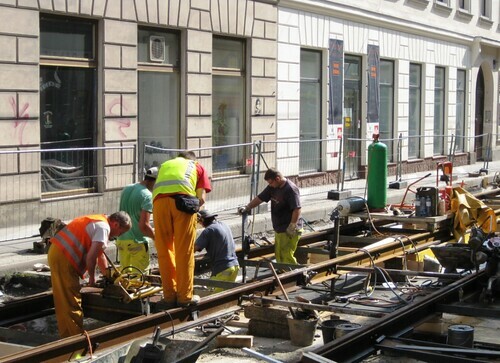 A variety of jacking devices and measurement tools are used in the process of setting the tracks. 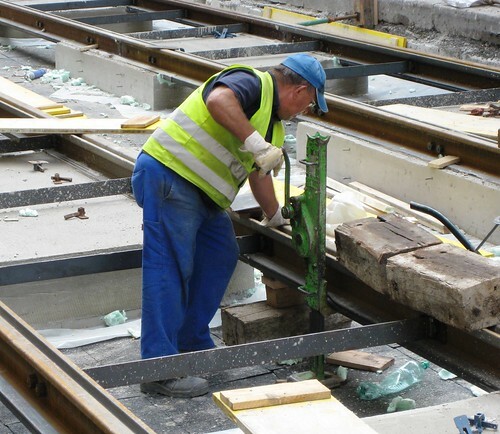 When tracks are at the right elevation, the workers bolt the track to the adjoining section. 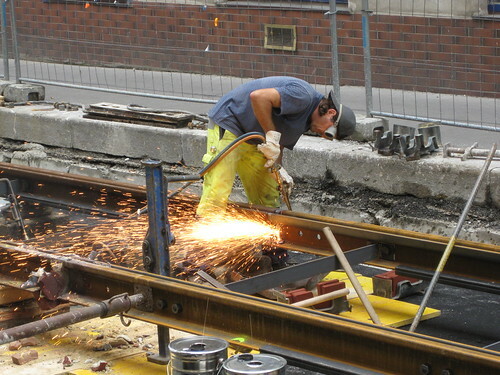 This photo shows the workers bolting one of the steel bars that keeps the two tracks the correct distance apart to the track, but the same tools are used to bolt one section of track to the next. 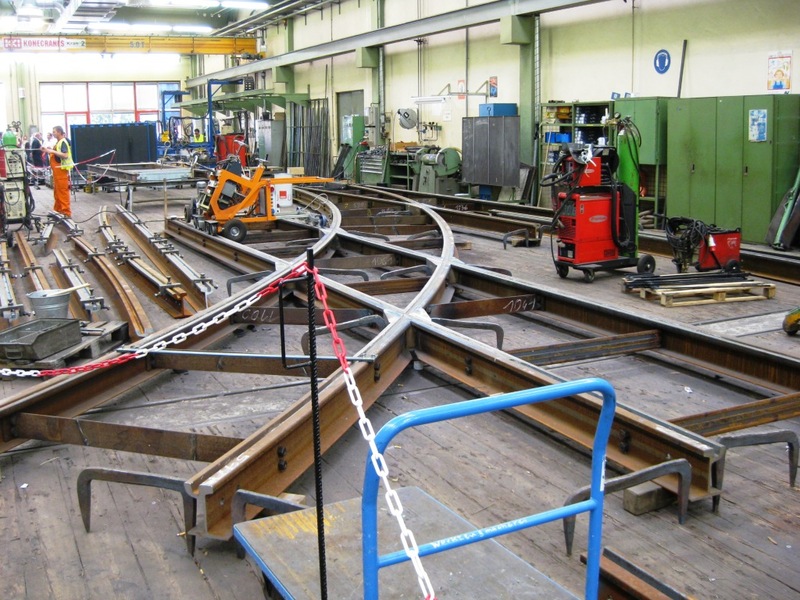 The process of placing the track, making sure it is in exactly the right position, supporting the track and welding the rail is very involved. 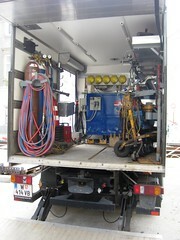 Here’s an overview photo, several smaller ones below. 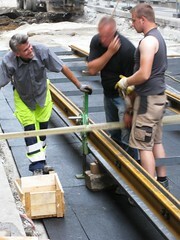 They keep checking elevation and placement all through the construction process. I guess they succeeded between the 2nd and 3rd photos below right. 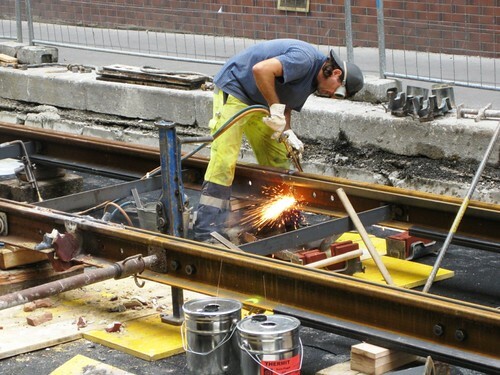 Here’s a video showing how the workers built the permanent track support structure. 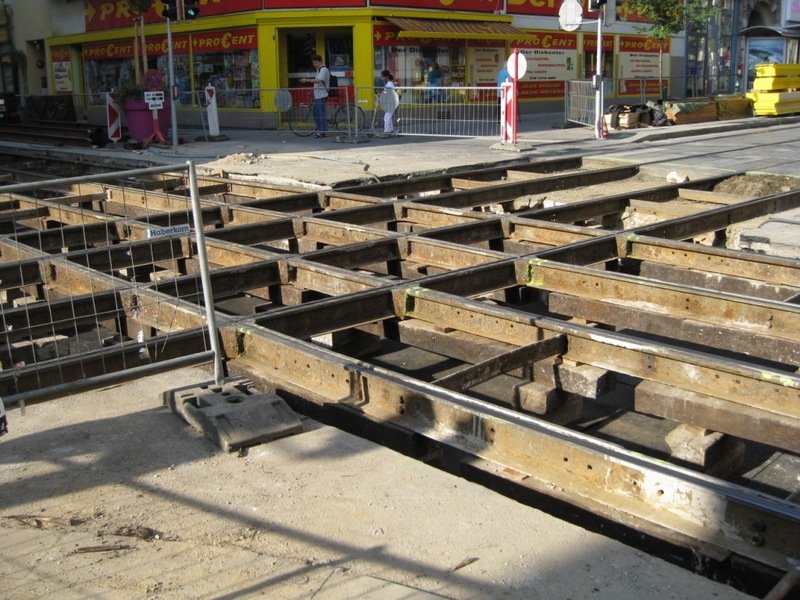 Here’s my post with all five Vienna Tram 49 Rehabilitation 2009 – Construction Videos. 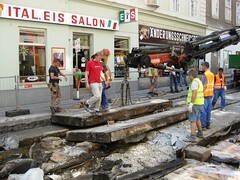 The first step in the reconstruction process is to demolish the existing street and remove the tracks. 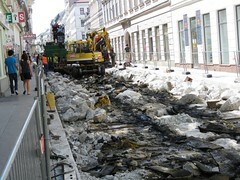 Here are photos of the street demolition process. 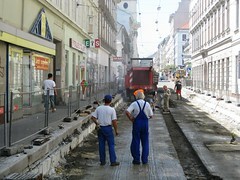 The street surface before reconstruction. 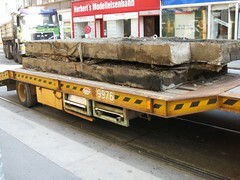 The photos below show how the prefabricated sections of street surface were removed and what was left over. 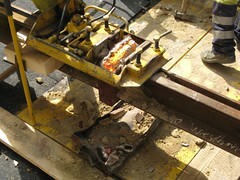 The video embedded at the bottom of this page shows the process of removing a prefabricated section. 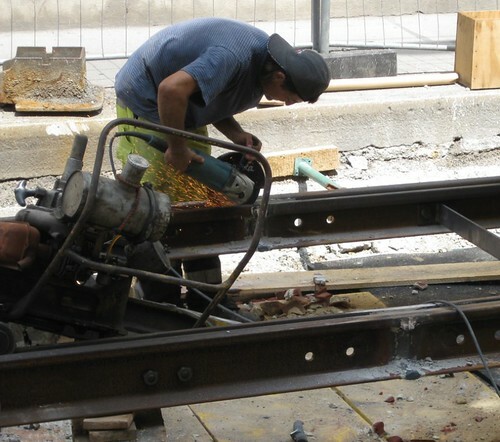 There were also sections of concrete street surface that needed to be broken-up with a jack hammer, so there was lots of work for man and machine. 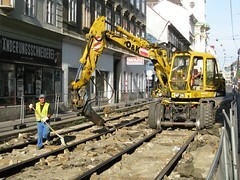 In the photo to the right the machine is moving out of the way so that a tram can pass through the site. 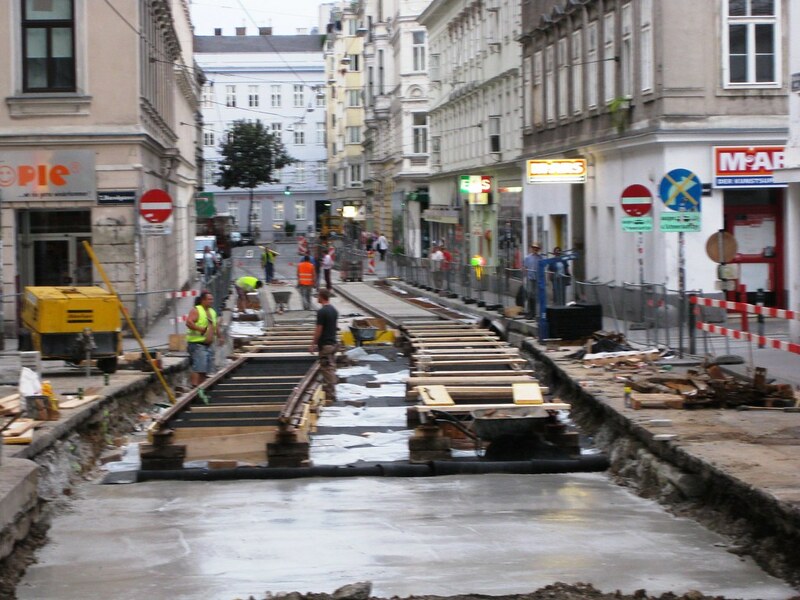 The tram route was shutdown for 16 days, but continued to run through most of the construction period. 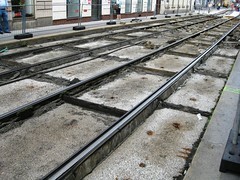 Once the surface section is gone, the track needed to be removed. 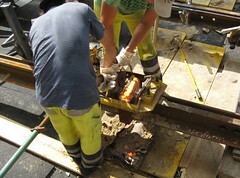 Here the machine is loosening the track from the subsurface. 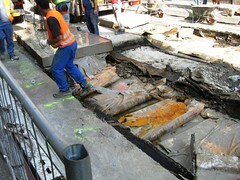 Once the track was gone, the subsurface sections could be removed. 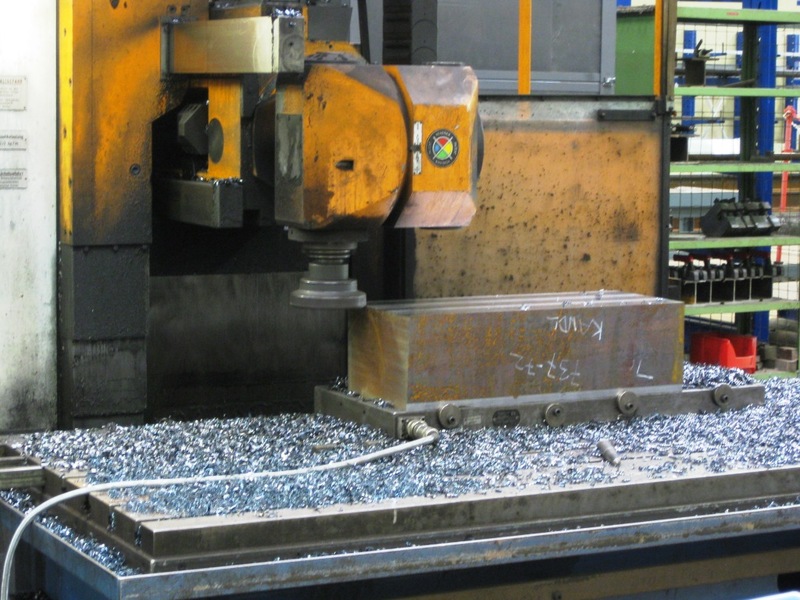 The process is shown in the video and in these photos. 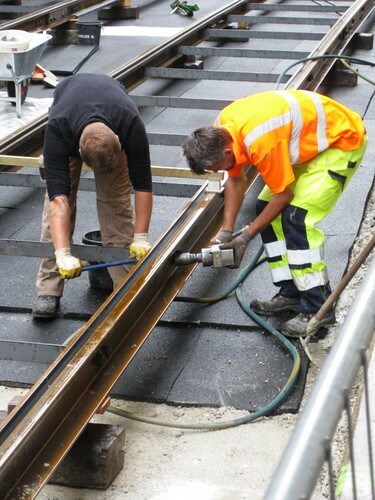 First the workers used a concrete saw to cut up sections of the subsurface, next they drilled bolts into the sections, and finally they lifted the sections out of the ground. 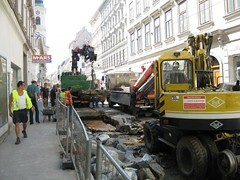 They are just about to lift the section out in the photo on the right. 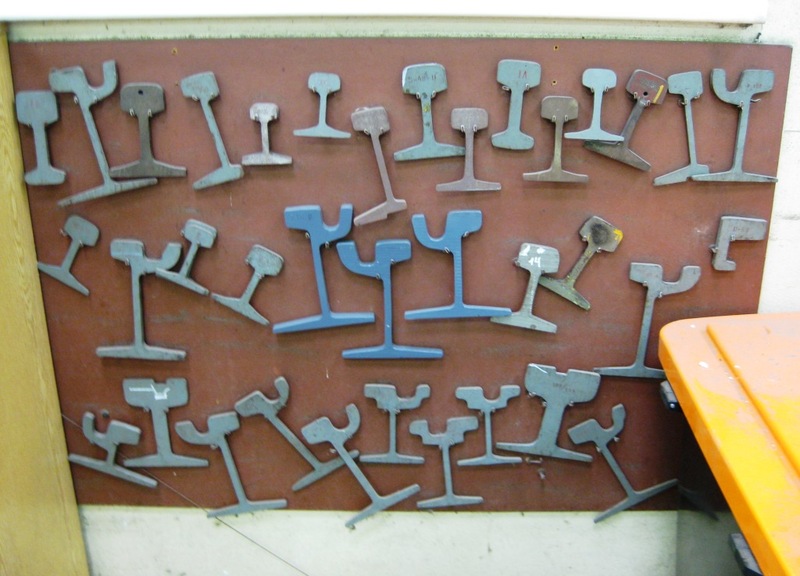 You can see the bolts for the other sections on the left side of the photo. 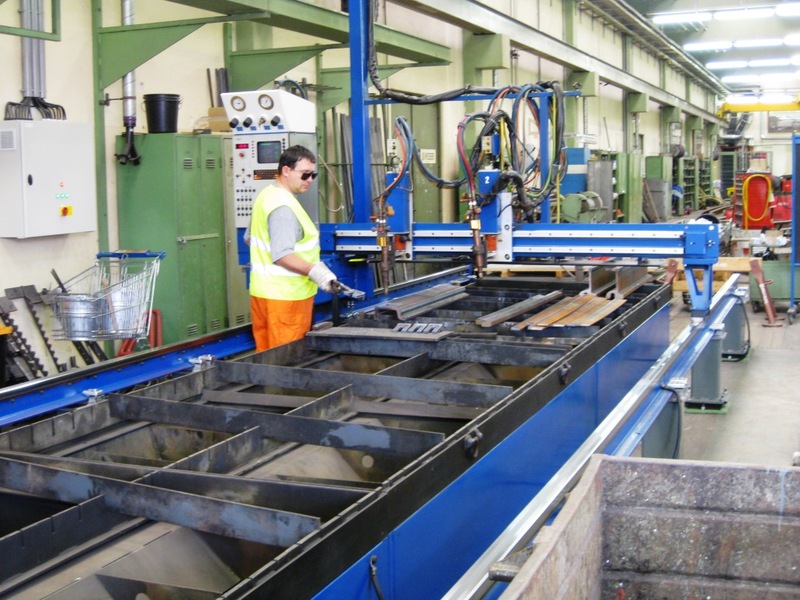 The photo below on the far right shows the sections loaded on a trailer on the way to recycling. 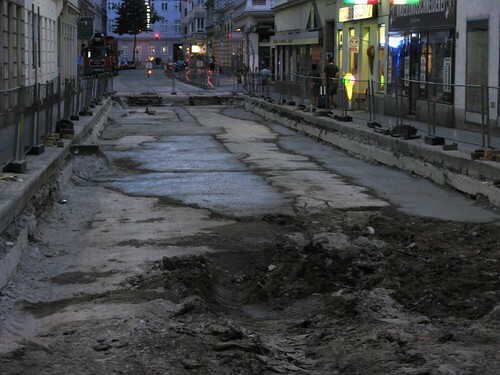 Here’s what the street looks like after they remove the substructure. 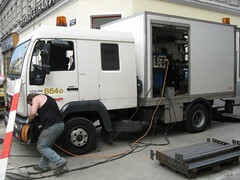 The jackhammer machine was used to break-up remaining concete. 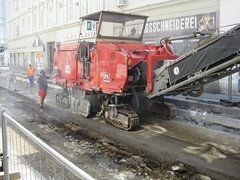 Next a grinding machine was used to clean up the bottom of the street. The new substructure will be built on top of this foundation. 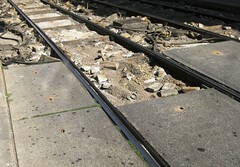 Once the surface had been ground, minor repairs were made to make sure it could provide a good foundation for construction of the new substructure and tracks. 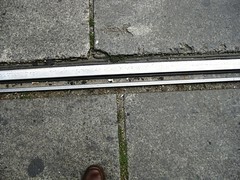 You can see the fresh concrete on parts of the surface in this photo. 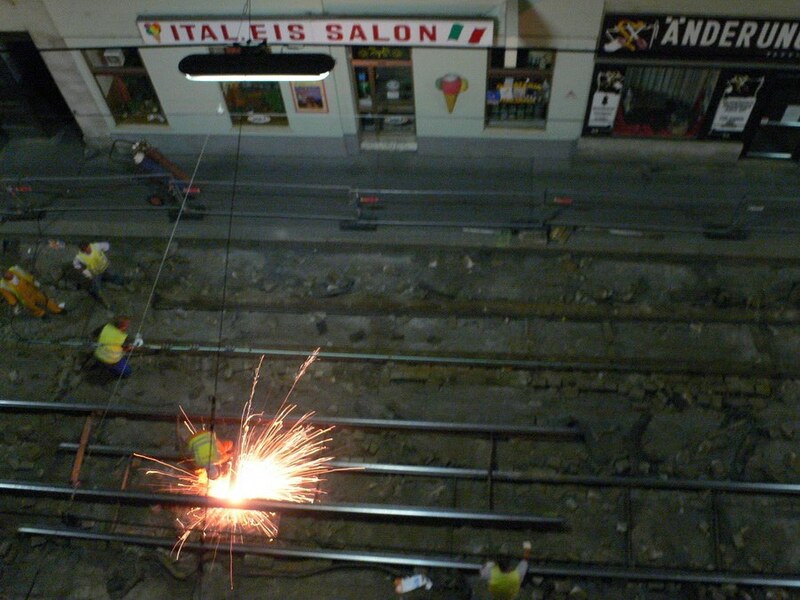 Here’s a video showing some of the street demolition process. 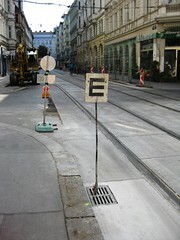 Signs are an important part of any construction project. 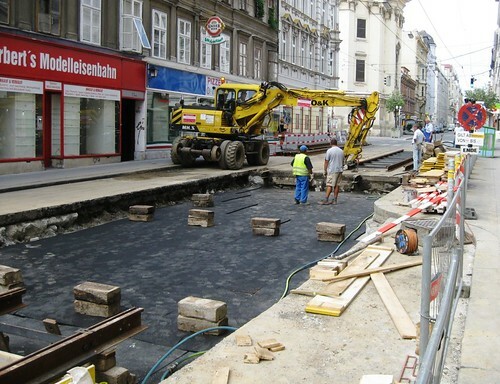 Here are some of the signs used on the Westbahnstrasse tram track reconstruction project. 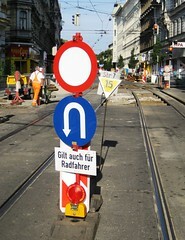 Here two signs placed on the street before the construction site. 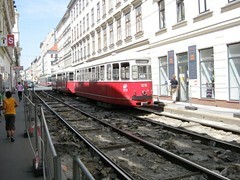 Trams are allowed, but other vehicles are forbidden from going further (although that doesn’t stop some people). 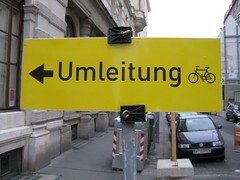 This sign says that all traffic must turn around – including bicyclists. 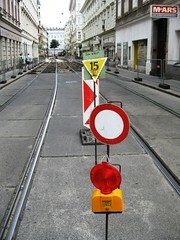 The little yellow triangle with 15 written in it means that trams must go at slow speed. Project information signs: on the sidewalk, at the tram stop and at the front door of buildings on Westbahnstrasse. 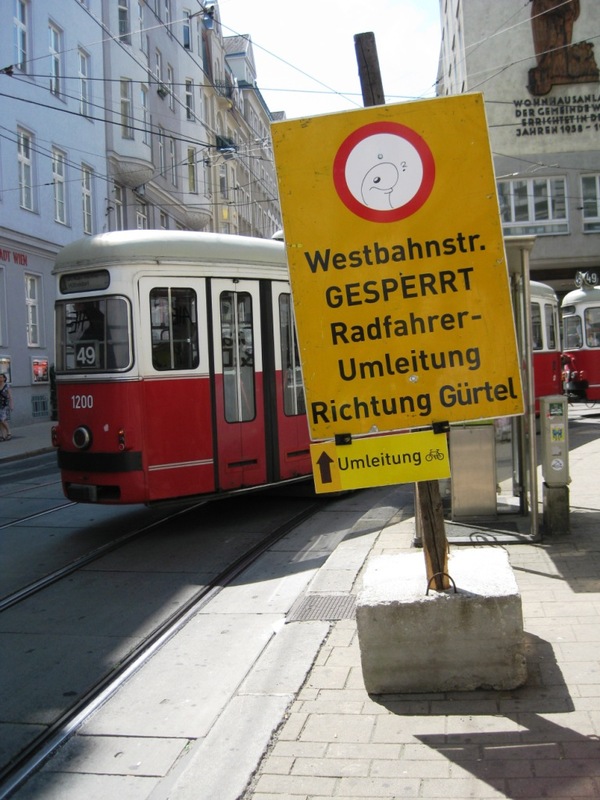 Warning sign, street closed ahead (Neubaugasse/Westbahnstrasse). Note the detour information for bicyclists too! 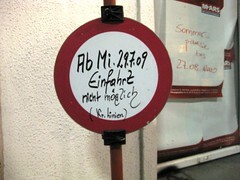 This sign says that after 29 July it is not possible to use this driveway. It’s a nice personal touch that it was written by hand on the standard “no entry” sign. 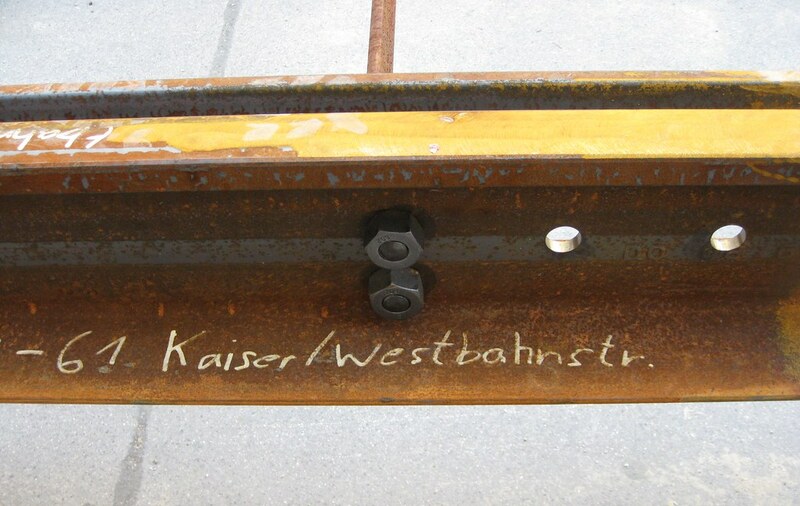 It’s signed: “Wr. Linien” for Wiener Linien, the public transport operator. 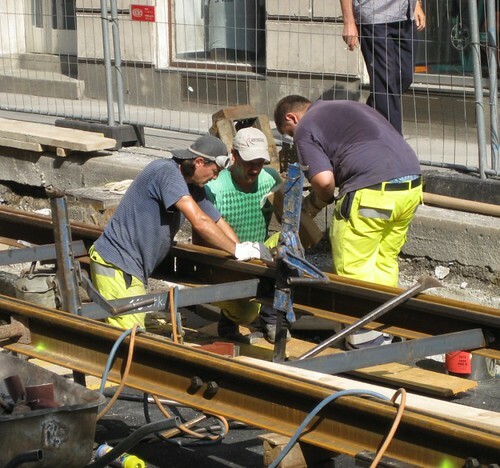 The sign at the far right (“E”) tells the tram drivers that they can go back to regular speed, it’s the “end” of the construction zone.